Kenya is classified as a chronically water scarce country. In response to the community’s water need, ABC- CDP has embarked on various workable and sustainable initiatives, with the aim of improving people’s livelihoods through increasing accessibility to potable water for domestic and livestock use. This has been done through appropriate water harvesting, storage and treatment techniques. Additionally, the program has sought to improve water resource management as well as improve water storage and harvesting capability. To achieve this, the program has partnered with number of stakeholders including the local communities, Ministry of water and donors. 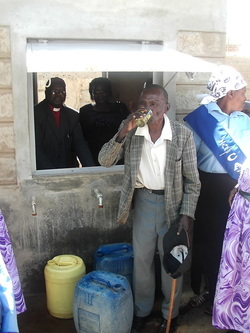 In partnership with various organizations, the Program has constructed water weirs, water tanks and boreholes. In the last five years, ( April 2007 – March 2012), the program in partnership with CBM/CIDA and local communities has constructed 12 water weirs (Sand dams) to increase water table from the ground as well as slowing down the running water along the streams and gullies which cause land degradation. 23 water tanks have been constructed as roof catchment to harvest the natural water resource, 4 shallow wells have been dug along the weirs and the program has assisted households to acquire water treatment kits for improved sanitation and reduction of water borne diseases. 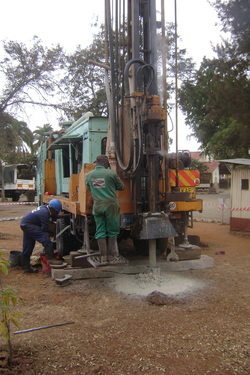 ABC- CDP in partnership with The Water Organization Canada, Living Water International – Kenya and Canadian Baptist Ministries have facilitated the drilling of 10 Boreholes in various places in Ukambani. In total, with the above mentioned partners and local communities, 10 boreholes have been drilled, 26 water tanks, 21 water weirs and 4 shallow wells constructed.